Personalized cufflinks symbolize both class and style. Finish your look with a set of custom engraved cufflinks from CuffLinks.com. When it comes to achieving a more distinguished style, adding your own personal flare is a valuable solution for standing apart from the masses. Using precise, diamond-cutting technology, your initials, date, phrase or logo will be engraved in an exact and elegant manner. Engravable tie bars or cufflinks make a touching wedding day gift for the groom and great groomsmen gifts, as well as a heartfelt anniversary, graduation, or birthday gift for men. We invite you to choose from hundreds of styles to find the perfect engravable gifts for any occasion. Personalized cufflinks for women and men come in a variety of styles expertly crafted to lend to a modern, sophisticated look. 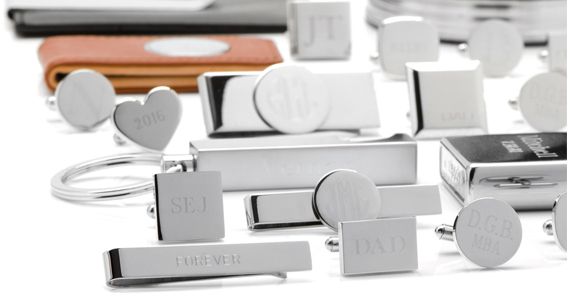 Engravable cufflinks and personalized gifts tell him or her just how much you care. Whether you're looking for locket cufflinks or engraved photo cufflinks to keep a photo of that special someone close, or you're adding your initials to matching set of studs and cufflinks, personalized cufflinks deliver a custom-tailored approach to fashion. You'll never want to part with your custom engraved cufflinks. Our most popular cufflinks in this category include gold engraved cufflinks, silver engraved cufflinks, monogramed silver cufflinks and sterling silver engravable cufflinks. When it comes to achieving that classic high-fashion look, you can't go wrong with personalized cufflinks. We have a wide-variety of custom engraved cufflinks for just about any occasion: make a tribute to all your hard work with graduation day degree cufflinks; boast your status with high-end 14K gold rope engravable cufflinks; or represent your lineage with custom family crest cufflinks. We even have personalized wedding day cufflinks which are some of the most popular wedding gifts for sale in our Wedding Shop. Explore our catalog of custom engraved cufflinks, above, to discover how personalized cufflinks can help you outshine your competition in the workplace, wedding parties and special events.